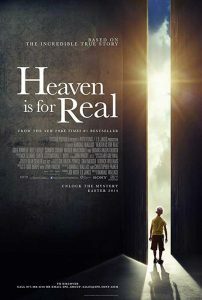 “Heaven Is for Real,” based on the best-selling book of the same name, tells the story of Colton Burpo, son of a Protestant minister, Todd, and his wife, Sonja. Todd pastors a small Nebraska church and sells garage-door openers to make ends meet. Sonja sings and directs the choir. The movie opens with Todd and his health problems: He breaks his leg playing softball, and, soon after, has a painful bout of kidney stones. Returning from a family trip to Denver, 4-year-old Colton begins to have severe stomach pains and a high fever. Initially diagnosed as the flu, Sonja and Todd keep him at home, but he only gets worse. Then they rush him to the local hospital, where Colton is diagnosed with a ruptured appendix. Todd and Sonja pray for Colton, and call other members of the church to join them in prayer. The surgery is successful, and eventually Colton is able to come home. He and his family go on with their routine life. Sinsinawa Art Gallery presents the Ninth Annual Sinsinawa Dominican Heritage Exhibit June 7–Aug. 8. This exhibit features art work by Sinsinawa Dominican Sister artists, as well as various works from the motherhouse collection. In addition, this summer’s show will feature delightful interpretations of the life of Father Samuel Mazzuchelli, OP, created by first, second, and third graders from Blessed Sacrament School in Madison, Wisconsin.